The key to a successful landscape is to work with your environment. Gardeners in arid zones may want to consider a desert garden theme that works with their soil, temperature and water availability. Part of learning how to make a desert garden is finding out what plants are best for desert gardens. Choosing the right plants will ensure that your landscape is healthy, easy to maintain and conserves resources. All this can add up to big money savings and spare you from the headaches associated with incorrect plants and placement. Desert soils are one of the biggest obstacles when planning a desert garden theme. They are generally highly alkaline with a pH of around eight or higher. Most plants thrive in moderate pH levels of 6 to 6.5, which means your plant choices are limited. The best option is to choose plants that are native to your area. 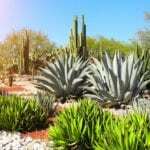 Native plants are specially adapted to the soil, weather and arid conditions of desert zones. Plan your landscape with this in mind and use a few other desert garden tips for the most suitable garden. Lawns are not practical in arid zones. 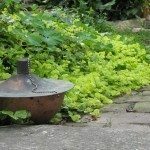 Replace traditional grass with drought tolerant ground cover, rocks and gravel. In some cases, re-grading your yard may be necessary to funnel infrequent rains to areas where you have groups of plants. Use drought tolerant plants where possible and set up a rain barrel to catch water for irrigation. Flagstones and other paving material make attractive paths and patios and combine attractively with other inorganic materials. Once you have the land graded and have set up the bare bones of the garden with non-living focal points and structural elements, it is time to find out what plants are best for desert gardens. What Plants are Best for Desert Gardens? While using native plants are among the best desert garden ideas, you can also use adaptive plants from similar regions. Ice plant makes an excellent ground cover and many sedums and sempervivum, like hens and chicks, will thrive in rocky gardens and containers. Choose tall plants for shade such as Acacia, Mesquite and Desert Willow. Consult with your local extension service for native plant sales and desert garden ideas. 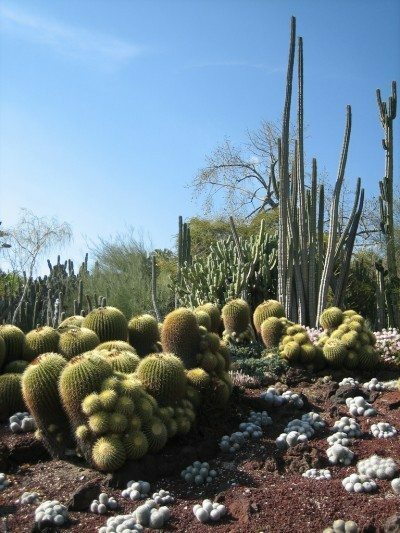 Cacti are slow growing and provide native focus in the landscape. Place succulent plants in areas that are low and may collect moisture. These are drought tolerant but tend to use more moisture than cacti. Container plants add dimension and interest to the garden. 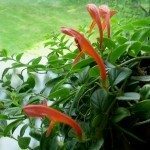 Smaller agaves, aloes, bougainvillea, mandevilla vine and hibiscus plants make excellent potted patio specimens. Pots can dry out even more quickly than plants in the ground, so take care to give them some supplemental water, especially during establishment. A small cactus container garden on the patio will tie in the whole theme and lends an air of authenticity to arid landscapes. If you are a beginning desert gardener, container plants are an excellent way of learning about what plants are best for desert gardens and how to take care of them.